All of our products are protected by international patents and manufactured exclusively by us in the UK. We do this to ensure tight quality control. We allow selected partner companies to resell our products to make it easier for customers to order from their preferred suppliers. Whoever you buy a BioStatus product from, you can be reassured that it has been manufactured by BioStatus. Where can I buy a BioStatus product? You can order here, direct from BioStatus, or from one of our selected channel partners Read more here. How do I contact BioStatus technical support? On every web page you will find a pull-out tab on the right - or if you are browsing on a mobile device, at the top of each page. Also, at the bottom of each web page you’ll find our contact details. We aim to answer your enquiry within 24hours. Does DRAQ5™ really get into live cells? Yes. DRAQ5™ has been proven to enter intact cells, as demonstrated by labeling the nucleus of all nucleated cells in a whole peripheral blood sample. It does this with excellent stoichiometry relative to the DNA content of individual cells. It does not label enucleated cells such as platelets and mature erythrocytes. You can learn more about DRAQ5™ here. Can I use DRAQ5™ instead of DAPI as a counterstain for my immunofluorescence slides? Yes. DRAQ5™ is an ideal counterstain for immunofluorescence. It is spectrally compatible with most visible-range fluors. Importantly, as a red-excited counterstain, it doesn’t require a UV-equipped microscope, so you can avoid all those DAPI queues! 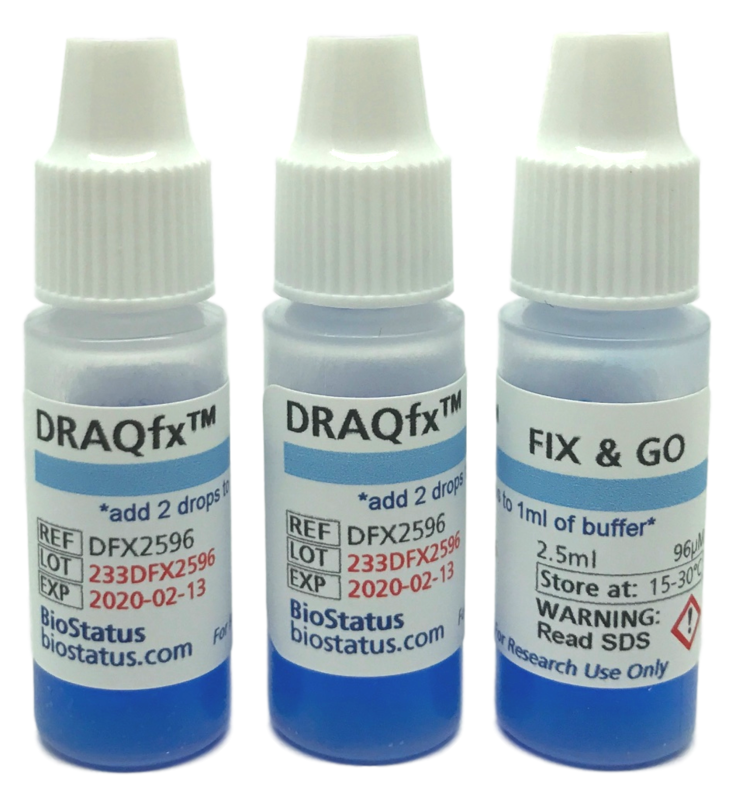 As we often say here; "get back on the right track - start using the DRAQ"
What are the advantages of DRAQ5™ as a counterstain for high content screening? DRAQ5™ is spectrally compatible with most visible fluors, importantly GFP, YFP and mitochondrial membrane probes like TMRM. It works on all the major platforms. Being cell permeant it can be seamlessly transferred from live cell assay development to the screening campaign on fixed cells. It provides a weak cytoplasmic signal that can offers valuable segmentation and morphometric information. It can be combined with formaldehyde to streamline fixation and staining procedures. Go to our HCS pages for the complete picture. Can I use DRAQ7™ instead of DAPI, PI or 7-AAD as a dead cell dye? 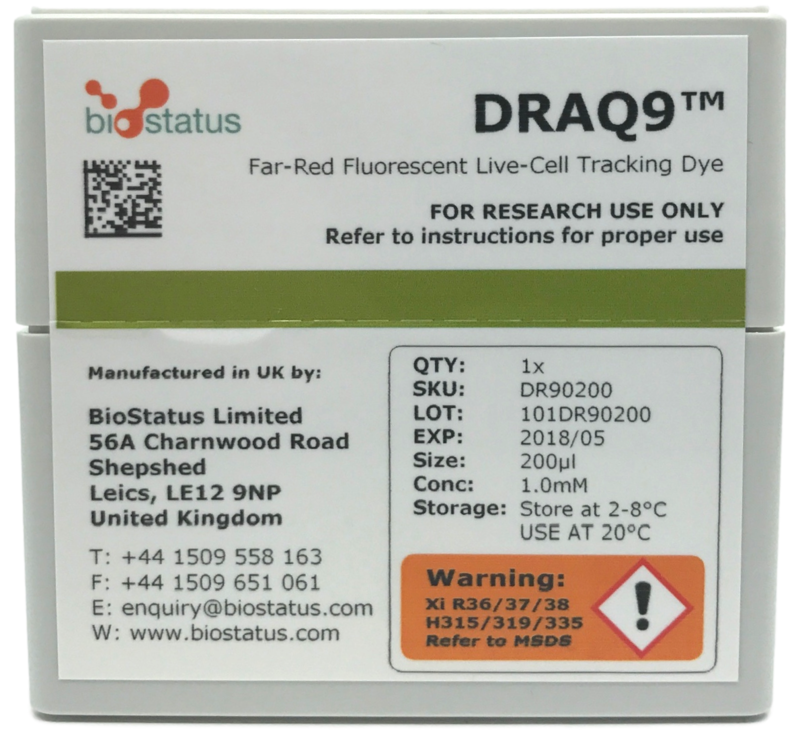 DRAQ7™ is compatible with a wide range of fluorescence microscopes and flow cytometers and can be used to detect damaged, dead and apoptotic cells. DRAQ7™ benefits from being a far-red fluorescing viability dye allowing you greater choice of chromophores for your other assay parameters. Uniquely, it has been validated for use in real-time assays. Read more here. Can I really gain a virtual channel on my cytometer with DRAQ7™? Yes! If you need to exclude dead cells from your analysis and your cytometer has at least two laser excitations (between 488 & 647 nm), then you can easily generate a virtual channel for dead cells using the multi-beam excitation feature of DRAQ7™. Once gated out these events disappear from all other channels, thereby requiring no compensation. Read more here.